There is so much vampire-y goodness for our Scary readers to sink their teeth into in the 105th Blood Relatives Issue of Scary Monsters Magazine. Dracula! The name alone strikes fear in our hearts, and the face we imagine is always that of Bela Lugosi. In our 105th Blood Relatives Issue, we consider Lugosi's evocative line, 'I never drink � wine" and examine whether or not a diet of blood really could sustain Dracula's life and the lives of other princes or princesses of darkness. We also take a close look at classic films starring Dracula's 'blood relatives," including Son of Dracula, Dracula's Daughter, Uncle Was a Vampire, and Nocturna: Granddaughter of Dracula. Also on tap we'll have our ever popular Scary Monsters features like Kaiju Korner, Tiny Tales of Terror, Scareviews and we'll be introducing a new column called Weird U.S.A. There's plenty to sink your teeth into and we bid you to ... subscribe, before the sun rises ... And there's much, much more in 144 vintage pulp pages for Monster Kids of all ages! COVER STORY: Vampire Nutrition - "I Never Drink...Wine"
Dark Shadows Lara Parker: Angelique Lives Forever! Scary Secret Photo, Caption This! & Who Said It? Full color cover art by Scott Jackson and vintage B&W content with 144 vintage pulp pages for Monster Kids of all ages! 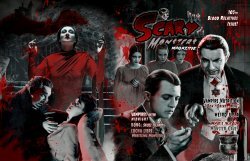 Published June 2017 by Rondo Award Winners and Monster Kids of the Year, Don and Vicki Smeraldi of MyMovieMonsters.com. Here is Dr. Gangrene's sneak preview of Scary Monsters #105!